Three police officers are facing disciplinary action over the case of a woman who was fined for wasting police time when she reported the stalker ex who went on to murder her. 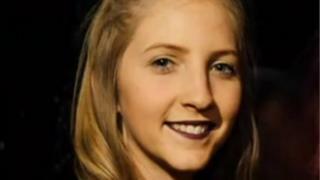 Shana Grice, 19, reported Michael Lane five times before he slit her throat and tried to burn her body. Her parents slammed Sussex Police for "treating her like a criminal", adding the action was "too little too late". A report found stalking cases were not being properly investigated. Two officers - one retired - will face gross misconduct proceedings at public hearings in May. Sharon Grice and Richard Green said: "Our daughter took her concerns to the police and instead of being protected was treated like a criminal. She paid for the police's lack of training, care and poor attitude with her life. "It's only right that the police make changes, but it's too little, too late for Shana. "Sussex Police should not be applauded for this." No further action will be taken against five officers investigated by the Independent Office for Police Conduct (IOPC), while six other force employees - three officers and three staff - have been given "management advice and further training". The independent report by Her Majesty's Inspectorate of Constabulary and Fire & Rescue Services (HMICFRS) was commissioned after Miss Grice was killed in her bedroom in Portslade, near Brighton, East Sussex, in 2016. Stalking and harassment is more common in Sussex than the national average, it said. However, victims were often not referred to specialised support services and the force regularly failed to use powers including searching perpetrators' homes or seeking injunctions. Lane fitted a tracker to Miss Grice's car and stole a house key to sneak into her room as she slept. He was given a life sentence with a minimum term of 25 years in March 2017. It later emerged that 13 other women had reported him to police for stalking. At his sentencing, Mr Justice Nicholas Green said officers had "jumped to conclusions" and "stereotyped" Miss Grice. Assistant Chief Constable Nick May said: "We deeply regret the tragic death of Shana Grice in 2016 and are committed to constantly improving our understanding of stalking and our response to it. "When we looked at the circumstances leading to Shana's murder, we felt we may not have done the very best we could and made a referral to the IOPC." Sarah Green, co-director of the End Violence Against Women Coalition, said: "The police watchdog findings that Sussex Police failed and that there will be misconduct hearings are welcome, but much more is needed. "Numerous inquests and inquiries have found that multiple police forces have failed to protect women who were murdered." The report also called on the National Police Chiefs' Council (NPCC) for a single definition for stalking to be adopted by police forces and government departments. Sussex Police has been given three months to make improvements.